Dim the lights by talking to the heart of your home theater. Amazon's Alexa voice assistant is already finding its way into TVs, so why not projectors? 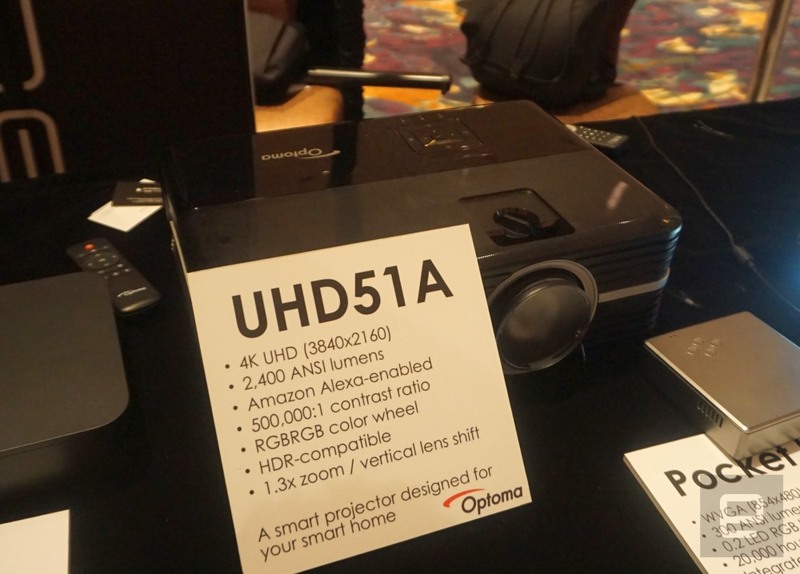 Optoma certainly thinks it makes sense -- the company has launched what it says is the first projector with Alexa built-in. The UHD51A is a capable 4K projector with 2,400-lumen brightness, a 500,000:1 contrast ratio and accurate colors with HDR, but the real star of the show is the ability to control the rest of your smart home. If you're ready to watch a movie, you can dim the lights and start the popcorn with spoken commands. There's also a built-in Android-based media player and a pair of 4K 60Hz-capable HDMI ports. The projector won't be a trivial purchase when it ships late in the first quarter for $1,699, but it could be a better deal if you were already thinking of getting an Alexa-equipped speaker and would rather consolidate two purchases into one. And if you don't need the AI companion, the UHD50 will offer the same performance at a lower $1,499 price tag.